How can a Forum on a site improve traffic and SEO results? Discussion forums are beneficial for a site in multiple ways. It is the ideal platform for your readers and users to engage more, with you and other members using your site. It is the perfect place for people to share their views and also get answers to questions that they did not know whom to ask. They meet more like minded people on the forum, and who knows, they could become the most loyal customers going forward. Traffic will increase once the forum develops into a serious board, where the more the merrier. Since the content on a forum is not emailed or updated in any other way than on the site it is hosted, readers have to come back to your page in order to read the latest on the thread. This will result in multiple visits and one reader may pull in friends whom he knows, would know about the subject being discussed (more hits!). People long to be part of a community, and a forum facilitates that. Via the questions and related discussions, all the keywords related to your field/site are thrown about. This gives your site a greater chance to come up when someone searches any of the keywords or key phrases. SEO becomes innate to the discussion threads going on, without falling into any pattern. Since SEO is automatic, your site shows up on more search results and more users are likely to see the discussion within the forum. Once within a site, users may opt to register and or do more within your site. As the moderator of the discussion forum on your site, you become aware of the pulse of the audience visiting the site. It is one of the best indicators of what brings people to your site (which in turn tells you what you should be writing more about!) or takes them elsewhere when they don't find it here. The forum should be used as a tool to guide your efforts. The forums will draw more people to your site; some of these people have been to your competitors' as well. If the forum data is analysed closely, you will learn what is not optimal on your site, who else does it and who is better at it. Users will mention links that are the answers. It is worthwhile to visit your own forum and take peek at what is going on. Discussions could lead to the next great idea or product. As the quality of the discussions taking place in your forum increases, the perception that your website has authority in the niche will grow commensurately. It should be noted that as your forum grows, you should ensure that the content on your main website can meet the needs of the visitors. 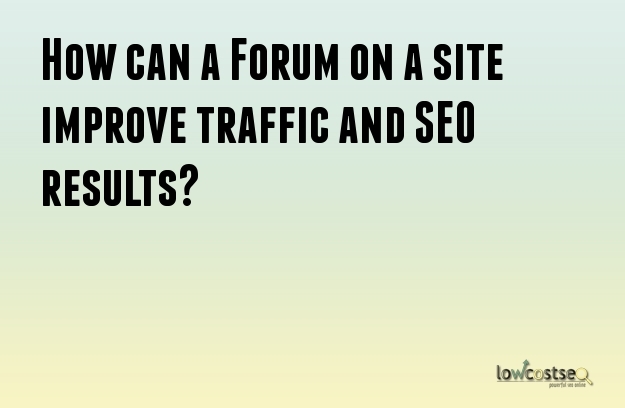 Hosting a discussion forum is surely a giant leap forward to getting more traffic and better SEO scores.